W.C. Mack has her first hockey themed children's book out. Aimed at readers 8 through 12, Hat Trick is a story of young hockey player JT McDonald who is unhappy to be bumped by a new player as the best player on the team. JT is none to happy about that, and that only leads to trouble away from the rink, too. But soon enough JT learns his new rival could turn into his best friend - on and off the ice. It's a good story with a good message. It is no classic by any stretch, but it is great that more and more hockey themed stories are becoming available for boys aged 8 through 12. After all, that is probably the most reluctant group of readers at the youth level. If hockey can get these boys to read more books, then that is a great accomplishment. The book is as much about doing well in school as it is doing well on the ice. 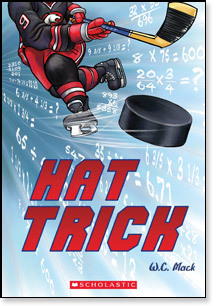 So if you have a young hockey fan who is perhaps a reluctant reader or struggling a bit in school, W. C. Mack's Hat Trick may be the perfect stocking stuffer this Christmas. JT McDonald is the smallest guy on the team - but he's not letting that interfere with his plans to rule the rink this hockey season. His blades are sharp, his focus is strong and he is determined to play against the biggest team in the league, no matter what his coach says. That is until a new player joins the team - a giant new player named Eddie Bosko - and he's a right winger too, just like JT. JT realizes his best moves look weak next to Eddie's. And to make matters worse when JT fails a math test, his mother grounds him, devastating his hockey happiness further. On the upside, while grounded, he wins a radio contest that will give him the chance to score a goal from centre line at the next Vancouver Canucks game. There's one catch: he won't be allowed to attend unless he pulls off a B on his next math test. Again his dreams seem just out of reach and he is almost ready to admit defeat. That is until he notices that Eddie Bosko is even better at math than he is at hockey. Is it possible that JT's biggest competition is also the one who can help him achieve his hockey goals? W.C. MACK was raised in Vancouver., BC, where she is certain her parents unwittingly cursed her writing career with a happy and stable childhood. Luckily, happiness did not impede her ability to write Hat Trick, nor her first book for middle-grade readers, After All, You're Callie Boone, also published by Scholastic. She lives in Portland, Oregon. Scholastic also has a sample excerpt available.